Here’s another fabulous chicken recipe to add to your Weight Watchers repertoire — a delicious Raspberry and Balsamic Chicken with Shallots Recipe with just a 7 Points total, from Eating Well. It’s and easy to make, is super yummy and makes a great healthy meal idea for the whole family. 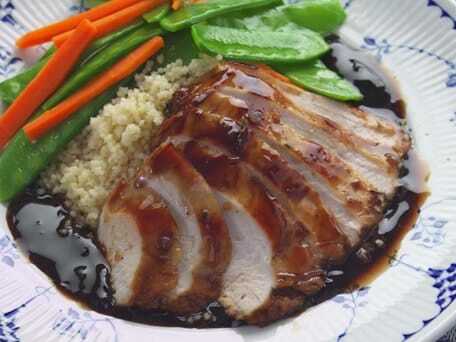 The sweet and sour of the raspberry balsamic sauce is perfect, and adds such great flavor. It’s a great go to meal when you need a quick weeknight dinner recipe that will make everyone happy. Combine jam and vinegar in a small pan over medium-low heat. Cook, stirring often, until the jam is dissolved, 3 to 4 minutes. Remove from heat, stir in salt and pepper and let cool slightly. Reserve 1/2 cup of the sauce. Place chicken breasts and the rest of the sauce in a large, seal-able plastic bag. Seal and shake gently to coat. Marinate in the refrigerator for 1 to 1 1/2 hours. Heat oil in a large nonstick skillet over medium-high heat. Add shallots and thyme and cook, stirring often, until the shallots begin to soften, about 1 minute. Remove the chicken from the marinade (discard marinade). Add the chicken to the pan and cook until just beginning to brown, 2 minutes on each side. Add the reserved raspberry sauce; stir to melt the jam and coat the chicken. Reduce heat to low, cover and cook until the chicken is cooked through and no longer pink in the center, 6 to 10 minutes. I made this for me and DH last night. It was fantastic and we will definitely make it again! This was FABULOUS! So flavorful, and leftovers reheated well for another meal later in the week. Making it again already–delicious!